Good Morning Traders! No clear cut technicals for Monday in terms of intra day chart formations for indexes. SP and Dow had four days of higher low and higher high, still in an uptrend on the hourly charts, but you can see not quite textbook sell divergences on the daily charts of the Dow and Sps and Russell…….still to be noted. The short term summation tick is oversold, downside may well be limited. Bonds and tends (as well as the Yen) had two big high to low days. The tens just tested and held a previous swing low. The sharp flush down was also made on news (morning economic numbers). Monday should be a Buy Day but scalp only. 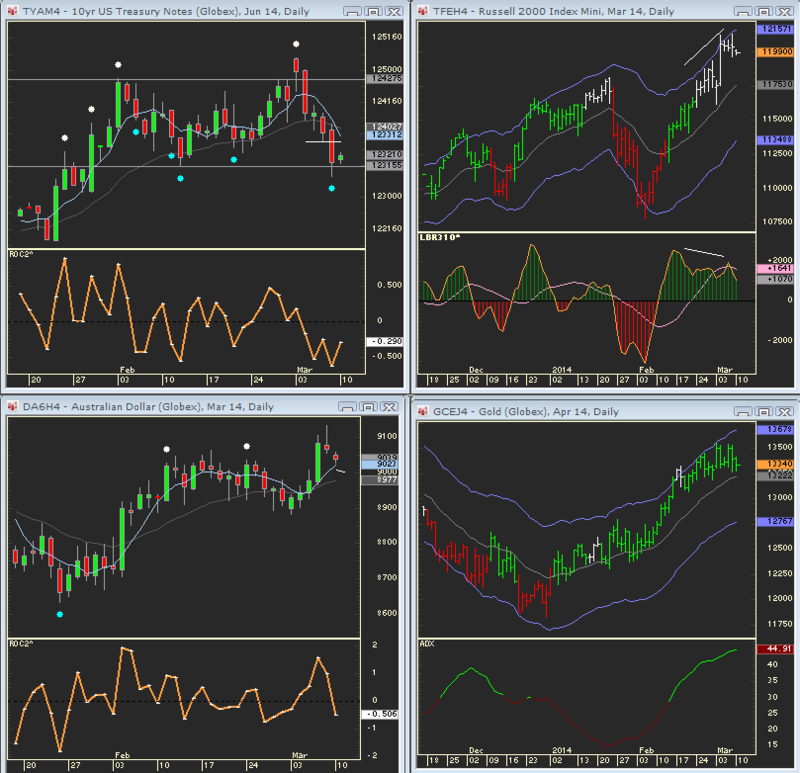 The bunds are short term oversold as well and closed with a Buy divergence on the 120 minute chart. However, they closed well up off their lows. Big news: metals – Gold will have daily GRAIL buys on any further down (see chart). Silver – testing BELOW recent range: 2102.5 would be a close back into the range and a buy if so. To the downside: 2063 was the swing high for the previous upside breakout and major support. Copper: historical has not been a strong correlation with gold – Friday’s action made no doubt about this with a killer technical downside breakout from a three bar triangle pattern. AD – Any further down below the daily 5 SMA is a buy ( 9022) EC: New momentum highs on the 20 period ROC are powerful – more upside. Yen: 4 days high to low – Buy day scalp only. C rude – Sell Short day after two days low to high, but in middle of range. GRAINS- corn – three pushes on on the hourly cahrts along with 2 pe34riod ROC sell divergences and sellingi tail suggest main upside is over. Likewise with the beans: Sell divergences on the 480 minute chart along with 2 blow off low to high days suggest time for a breather. Index futures will roll this week – main pattern for this week and next is that the first part of the week often does opposite the second half: ie., if the first part of the week is down, the last half of the week is up or vice versa. This will be the first triples of 2014 and often involves some major unwind cross currents (otherwise know as options manipulation).